Friday, sunny and not terribly hot and Songkran is next week. I read this morning that some schools have begun the Songkran celebration with prayers and blessing, so the New Year celebrations are kicking off in Thailand. Songkran is an important holiday for Thai people, it is observed much like the Chinese New Year with many returning to their towns and villages to be with family. Most, if not all, business will grind to a halt for the entire week of 11-15 April. Last year I was shocked at the extent of the holiday, from street venders to banks, everyone is on holiday. For tourists in Thailand and Bangkok, do not worry as all hotel, most restaurants and sights are all open. 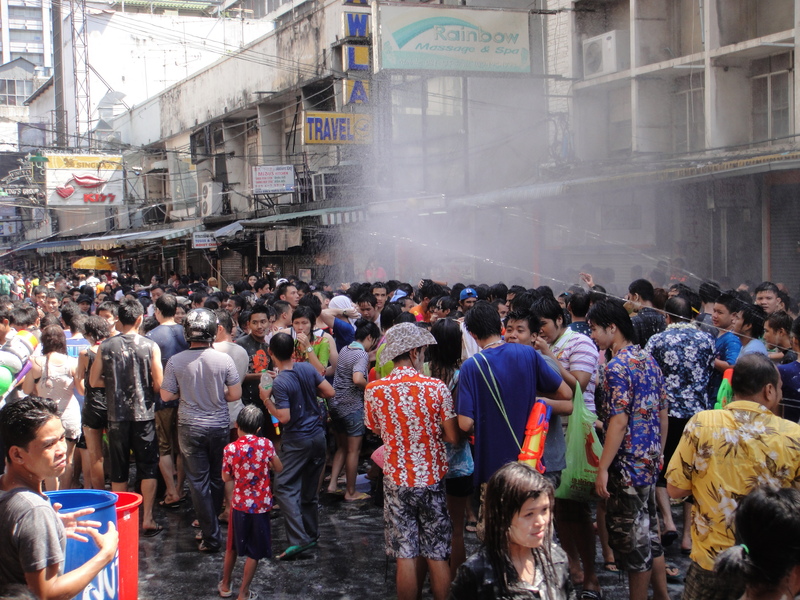 It’s a fun holiday due to the “play with water”; all of Bangkok is a major water battle. The weather has warmed from a few weeks ago, there are no street protests (unlike 2010) and much of the talk of coups and elections will be put on hold- time to celebrate the New Year. This entry was posted in Bangkok, Culture, Thailand and tagged Bangkok, current events, sightseeing, Songkran, songkran 2011, Thailand Travel. Bookmark the permalink.